Using a roll, dowel pin, or gage pin to measure angles is very common in mold and tool making. There are two choices available to represent the orientation of the angle. 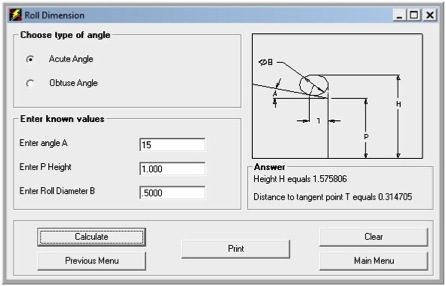 Just enter the angle, the height to the theoretical sharp corner, and the pin or roll diameter, press calculate, and the height over the roll is calculated for you. No more using charts and cheat sheets.